Orphenadrine (sold under the brand names Norflex, Mephenamin, Disipal, Banflex, Flexon, Biorphen, Brocasipal, and others) is an anticholinergic drug of the ethanolamine antihistamine class with prominent CNS and peripheral actions used to treat painful muscle spasm and other symptoms and conditions as well as some aspects of Parkinson's Disease. It is closely related to diphenhydramine and therefore related to other drugs used for Parkinson's like benztropine and trihexyphenidyl and is also structurally related to nefopam, a centrally-acting yet non-opioid analgesic. The combination of anticholinergic effects and CNS penetration make orphenadrine useful for pain of all aetiologies including pain from radiculopathy, muscle pain, headaches, and many others. Some patients report that it feels like orphenadrine and similar drugs help both NSAIDs and opioids find the pain. Orphenadrine has approximately 58 per cent of the anticholinergic potency of atropine at equivalent doses. Orphenadrine is most often used against pain and muscle spasm of various aetiologies including lumbago, sciatica, and injury. It is quite useful against allergic symptoms and other histimine-related effects, such as those from hayfever, other allergies, and histamine release from many opioid analgesics. Orphenadrine is in many cases helpful against migraine and cluster headaches and is also used for treating some aspects of Parkinson's Disease including side effects caused by the main therapy in place. Where available for prescription compounding, orphenadrine can also be prepared for topical administration and works slightly better than diphenhydramine for this purpose. The orphenadrine salt used for Parkinsonism is the hydrochloride, whereas the muscle relaxant tablet are the citrate, and manufacturers' descriptions of orphenadrine indicate that the salts are not interchangeable; one reason may be that the citrate can be irritating when injected. Euphoria is an effect reported by many patients and orphenadrine has been investigated for use against depression, as first reported in June 1958 in the American Journal of Psychiatry. Like many first-generation antihistamines and chemically-similar anticholinergics, orphenadrine can also cause excitement and insomnia, particularly in children and the elderly. Orphenadrine also works on smooth muscle in a manner identical to that of dicyclomine (Bentyl) and will impact Irritable Bowel Syndrome in a similar fashion. Orphenadrine is a methylated derivative of diphenhydramine (Benadryl, Sominex, Nytol, etc. ), and thus belongs to the ethanolamine family of antihistamines. It is produced by reacting dimethylaminoethanol with 2-methylbenzhydryl chloride. The 2-methylbenzhydryl chloride can be formed via a Grignard reaction. The free base has a molecular weight of 269.38 and an empirical formula of C18H23NO. The molecular weight of orphenadrine hydrochloride is 305.85, and 461.50 for the citrate. Orphenadrine is act as an anticholinergic and NMDA receptor antagonist. The action of orphenadrine against muscle spasm and the pain produced by it, pain produced independent of muscle spasm, neuropathic pain, and the extrapyramidal effects of Parkinson's Disease and treatments thereof, are the result of orphenadrine's moderate anticholinergic activity. Orphenadrine is used to treat muscle injuries, skeletal muscle tension and rigidity secondary to afflictions such prolapsed discs and degenerative soft tissue disease especially in the lower back, neck, and joints. and other causes of muscle spasms, to potentiate the action of opioid analgesics against moderate to severe neuropathic pain, and it is also used to treat Parkinson's disease. Orphenadrine is also a component of various preparations for use against headaches of various types especially tension and histamine headaches. It is also helpful in many cases of fibromyalgia. The effect on neuropathic pain, which is also in many cases generated by cyclobenzaprine (Flexeril), atropine, scopolamine, hyoscyamine, trazodone, many first-generation antihistamines, and chemically related drugs like dicyclomine, a.k.a. 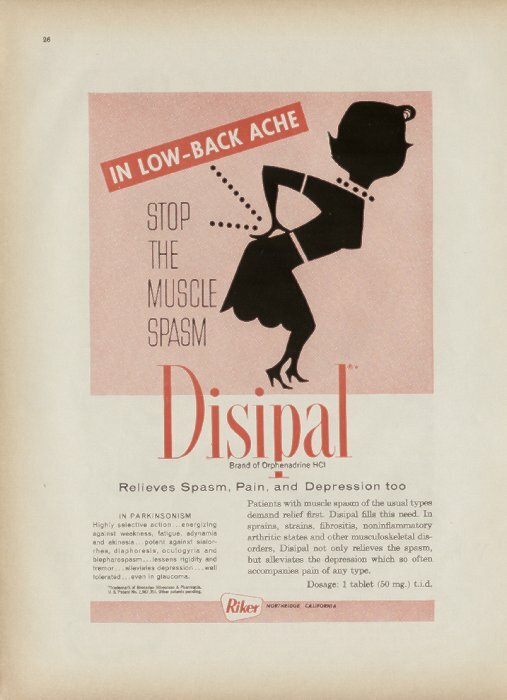 dicycloverine, (Bentyl), trihexyphenidyl (Artane), first-generation tricyclic antidepressants such as amitriptyline, and other similar drugs, are said by many patients to seem to "help the painkillers find the pain".A direct analgesic effect of orphenadrine comes from relaxing painful muscle spasms as well as central antimuscarinic (atropine-like anticholinergic, see below) action and possibly its local anaesthetic effects. The adjuvant analgesic effect of orphenadrine is neither antagonised nor directly duplicated by some other drugs used for this purpose, such as baclofen (Lioresal), clonidine (Catapres) and others, or gabapentin (Neurontin) so the effects are largely additive if used in combination (same goes for side effects, however), and such medication protocols need close monitoring by a physician especially when other centrally-acting drugs are being used to treat the pain.Cyclobenzaprine, tricyclic anti-depressants, and antihistamines do, however, have additive side effects but little improvement in the clinically desired effects in that they duplicate and compete with each other in this respect. Orphenadrine can be used in protocols for treating chronic and/or recurring pain as an alternative to gabapentin (Neurontin) as an adjuvant analgesic for management of chronic pain with a neuropathic component amongst those who cannot tolerate the side effects of gabapentin; this is also the case for patients in whom duloxetine (Cymbalta) is contraindicated. Orphenadrine has fewer side effects than many first-generation anti-depressants, cyclobenzaprine, trazadone, clonidine, and other drugs used in chronic pain states. The citrate salt of orphenadrine is available as Norflex, Banflex, Flexon, and X-Otag, and the hydrochloride salt is available as Disipal and Mephenamin. In the United States and Canada, orphenadrine citrate is supplied as 100 mg controlled-release tablets, 100 mg immediate-release tablets, and 60 mg immediate-release tablets. Orphenadrine hydrochloride is supplied as 50 and 60 mg tablets, a 10 mg/ml oral solution and 30 mg/ml solution for injection. Orphenadrine is also available mixed with aspirin, paracetamol (Anarex), ibuprofen, caffeine, and/or codeine in many places. All orphenadrine preparations require a prescription in the United States and the various oral forms are over the counter in Canada; orphenadrine is also available in many European and Pacific Rim countries (including Australia), by prescription in all of them except Belgium, Mexico and Canada where single-ingredient and combination products are available over the counter. It is available over the counter in the Philippines as Norgesic (35 mg Orphenadrine Citrate/450 mg Paracetamol) and Norgesic Forte (50 mg Orphenadrine Citrate/650 mg Paracetamol) from 3M Pharmaceuticals. Orphenadrine is not available at this time in Japan, Slovenia, Croatia, China, France and Spain. The muscle-relaxant and analgesic dose of orphenadrine is 100 mg when it is a (theoretical) 12-hour extended release tablet or 60 or 100 mg q8h immediate-release. In common with extended release tablets of other drugs, Norflex extended-release tablets more frequently than not require dosing every six or eight hours. It is not clear if the extended-release form of orphenadrine is more effective on a milligram basis than the immediate-release formulations. The dose to be used in therapy for Parkinson's Disease is 60 mg via the oral, intramuscular, or intravenous route. According to patients for both muscle spasm and Parkinson's Disease, the alternative routes for administration via the mouth (sublingual or buccal) or other transmucosal routes do not appear to impart any therapeutic advantage, and this would seem to include the rectal route as well. Orphenadrine has the side effects of the antihistamines in large part; notably, stimulation is somewhat more common than with other related antihistamines, and is especially common in the elderly. Common side effects are therefore dry mouth, dizziness, drowsiness, restlessness, insomnia, constipation, urine retention, orthostatic hypotension, and euphoria. The drowsiness and similar side effect tend to resolve within the first three to seven days of therapy. The euphoria is slight to moderate and subjectively different from that of both opioids and carisoprodol; the somewhat cleaner side effect profile than cyclobenzaprine increases the therapeutic usefulness of the euphorigenic and anxiolytic effects. The cautions and contraindications that apply to other antihistamines in its group apply. Dry mouth should be treated to prevent trouble with teeth. One should avoid driving and operating heavy machinery until such time as the effect is known. Constipation is possible but usually less severe than that caused by opioids. Aside from brief rebound stiffness in some patients, orphenadrine does not produce detectable cessation symptoms after therapy is discontinued. ^ Fernández-Sánchez MT, Díaz-Trelles R, Groppetti A, et al. (2002). "Nefopam, an analogue of orphenadrine, protects against both NMDA receptor-dependent and independent veratridine-induced neurotoxicity". Amino acids 23 (1-3): 31–6. doi:10.1007/s00726-001-0106-6. PMID 12373515. ^ ROBITSCHER JB, PULVER SE (June 1958). "Orphenadrine in the treatment of depression; a preliminary study". The American journal of psychiatry 114 (12): 1113–5. PMID 13533653. http://ajp.psychiatryonline.org/cgi/pmidlookup?view=long&pmid=13533653. PubChem Substance Summary: Orphenadrine National Center for Biotechnology.